I do regular travel and missions with my wing friend CMDR Noble Eagle and we decided to go visit our first black hole. My base at the moment where I keep most of my ships is in the Eravate system, so we picked something relatively close by. There is a small black hole right in the middle of the Pleiades Nebula in the system of Maia. I hadn't been to the Pleiades before either so why not kill two birds with one stone. It look quite pretty as you get closer and then once you are in the middle of it you are surrounded by gas clouds of green and red. The black hole there is very small, but you can see a gravitational lens effect as stars appears to spin around the black hole. You do need to get pretty close to it. I got as close as 20 Mm and no ill effects. With black holes you need to watch your temp gauge, because it can increase very rapidly if you get too close, but this one is pretty tame. 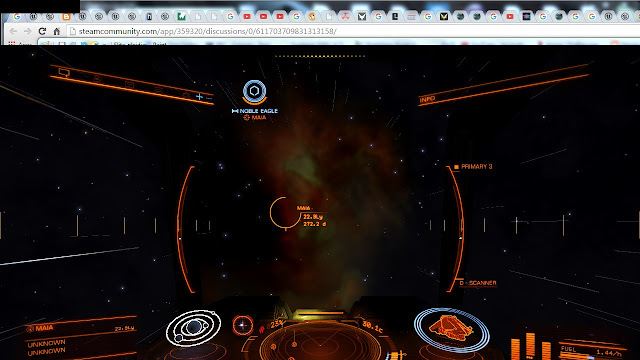 Good one to visit if you are a beginner with Elite. Oh, if you are visiting a black hole take a detail scanner along with basic scanner or higher(you need both). I got about 40k Credits from scanning the black hole, and with my Advanced Scanner, I made over 250k on that trip once I cashed in my Cartographics data.